Happy (almost) Thanksgiving, Pint Jockeys! We’re going to keep today’s post short and sweet to let you get right to the cooking for the big day tomorrow. 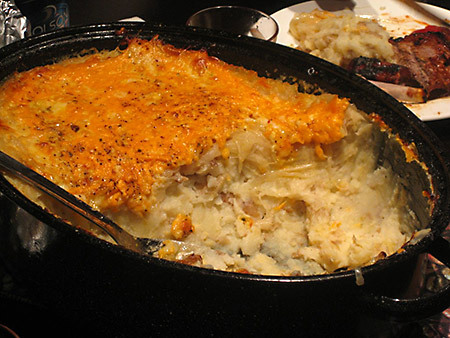 We think it’s safe to say that mashed potatoes are probably one of the greatest foods on earth. Our mothers make the best (obviously) but if you’re charged with bringing a side dish to this year’s Thanksgiving dinner, look no further than this recipe for “Heavenly Mashed Potatoes” made with the nectar of the gods – craft beer. These roasted garlic mashed potatoes with beer braised caramelized onions topped with cheddar cheese will serve about 4-6 people, so be sure to double up on all ingredients if you’re expecting a big showing at the dining table. There’s no way this dish can turn out any way but delicious, right? 1. Cut the heads of garlic about very close to the top, exposing the cloves. 2. Create a pouch of tinfoil and put the garlic heads in the pouch. Add a drizzle of olive oil, and a pinch of salt and pepper to the garlic. 3. Place the pouch in a 375°F oven for 45 min (or until garlic becomes soft). 4. Thinly slice the onions and place them in a sauté pan with olive oil on medium heat. 5. Add half of a bottle of beer to the onions and cook them until the liquid evaporates, then add the other half. 6. While the onions are cooking, cut the potatoes in pieces and place them in a large pot of boiling water. 7. Strain the potatoes when they become soft. 8. Pour the hot potatoes back in the pot and mash them. 9. Squeeze the garlic from the heads, and add the butter, milk, salt, and pepper to the potatoes and put it all into a casserole dish. 10. Pour the caramelized onions on top of the mashed potatoes. Spread them out evenly. 11. Add the shredded cheddar cheese on top, and place the potatoes in the oven until the cheese has melted. 12. Serve and enjoy with the other bottle of beer. Cheers, Pint Jockeys! We hope you enjoy this very special holiday with loved ones, good friends, and good brews. 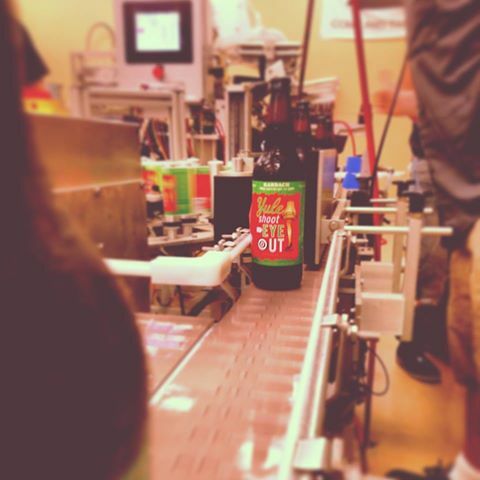 I know I don’t deserve anything special this year, but there’s a really awesome beer I’d like to get my hands on called Yule Shoot Your Eye Out. I know my boss will tell you I really botched the Penske file and I forgot my anniversary (again), but I PROMISE I will be good if you could get me some of that beer. It’s loaded with specialty malts, fresh ginger, cocoa nibs, orange peel and other holiday spices. I heard Karbach only brews a limited quantity so if you could just think back to that year when I was SO good and you got me the BB gun, that would be great. Already adding this one to your own list for Santa this year? Yeah, we thought so. 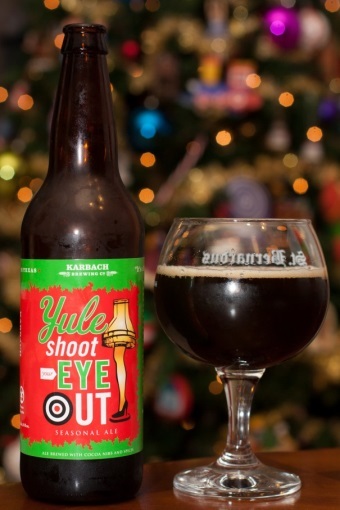 Karbach Yule Shoot Your Eye Out is a “winter warmer” style seasonal beer. Dark brown in color with a nose of nutmeg, clove, chocolate and various holiday spices, this beer produces a solid head of foam that doesn’t let up until the very last drop has been sipped. It pours a deep ruby color and leaves behind lots of sticky spider web lacing. This is a spicy and complex brew, with flavors of malt, ginger, orange peel, chocolate, nutmeg, clove and allspice throughout with some dark roast notes, along with hints of plum and cherry. 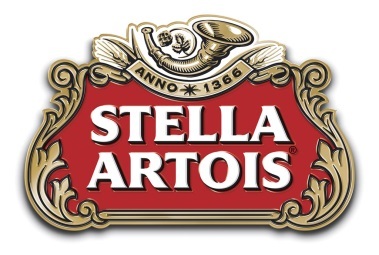 This beer has a creamy mouthfeel, leaving an aftertaste that is as deliciously decadent as your favorite dessert. While initially bitter, the flavors blend together nicely as you sip, leading to a smooth and satisfying finish. Available for a limited time only this winter season, you’ll want to get your hands on this one as soon as possible. Texas City and Victoria-area Pint Jockeys will oh-so-luckily get a chance to check it out before making any big buys at our November tasting events this Thursday. Whether you try it out at a tasting event or already have one foot out the door to go pick up a bomber or a pint, let us know what you think in the comments below. We’ll be back here next week bringing you more insider info. on the best craft beer in the Lone Star State. See you soon, Pint Jockeys – cheers! What are you thankful for this year? As Thanksgiving approaches and you find yourself reflecting on all of life’s many gifts, allow us to suggest one more to add to your list: Saint Arnold Icon Red. Released only yesterday, November 11th, this Bohemian Pils joins the prestigious Saint Arnold Icon series, an exclusive series of beers only released for about three months at a time. 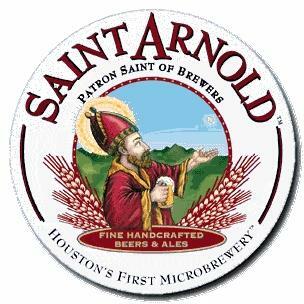 Some will of these beers are iconic of a beer style (which was the original concept), while some demonstrate more creative interpretations or melding of beer styles, from recipes conceived and refined by Saint Arnold brewers. When crafting this brew, the folks at Saint Arnold were inspired by hop buying trips to the Czech Republic. They aimed to create something similar to the unfiltered, unpasteurized pilsners common to the region, but with a higher emphasis on flavor and aromatic hops. 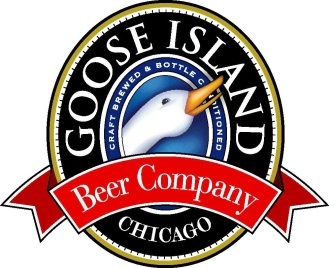 This beer starts with a distinctive Saaz hop nose, moving to a pleasant maltiness followed by a floral, spicy and earthy hop flavor that wraps up with a bitter finish. Made with only one malt (pils) and one hop (Saaz), this is a deceptively simple, light and refreshing beer. The Saaz hops speak to the beer’s simple and pure nature, dating back to the earliest days of brewing. In fact, they’re the only hop used in brewing that has never been hybridized. Most of the maltiness in Icon Red comes from the “decoction mash” – a rare, traditional method used for heating the mash in which a portion of the mash is removed, boiled, and then mixed back in. All this boiling causes caramelization, which gives the beer its deep color and rich body. This beer is best enjoyed at 40° to 55°F and is on shelves NOW! What are you waiting for, Pint Jockeys? Check it out today and let us know what you think. Share where you found it with other Pint Jockeys on our Facebook page. 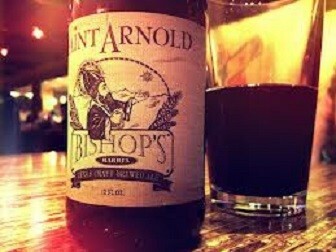 Until we meet again, cheers to you and cheers to another “iconic” Saint Arnold beer!